From Easter to Pentecost (April 1-May 20) we are joining together in daily prayer. Everyone is welcome to participate! Whichever you choose, I invite you to sit with the prompt and listen to what God is speaking to your heart & mind. Invite your time spent in prayer and reflection to resonate across the span of your day. Whether you have a few moments or a half-hour, the length of time you spend is not what is most important. Whether you end up praying every day or a few times each week, the frequency of your praying is not what is most important. 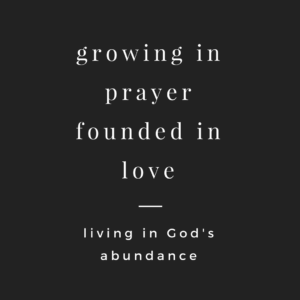 What matters is the desire for growth and connection that you bring to these days – for yourself and for our community of faith (or for your own!). Through your desire and the infinite Mystery of the Holy, amazing things will happen. May you experience life in God’s abundance.